We can design, build and install from single units to complete line assemblies. Depending by the application we can offer belt, modular or slat chain conveyors. 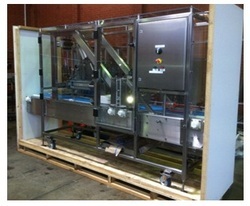 · Dry application for packaging lines that use plastic containers, bottles or carton boxes. drying. We can also offer designs that allow the quick removal of the belt without the use of tools for daily cleaning (i.e. some applications in the dairy industry). Follow this link to watch our video. Download here our brochure for more of our stainless steel equipment and automatic pail lid closer. · Access platforms for operations or maintenance or inspection. 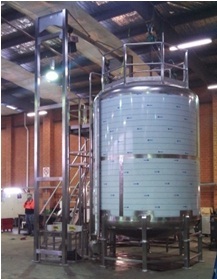 20,000 L formulation tank with access platform and gantry. Please follow the link to Google plus for more info. 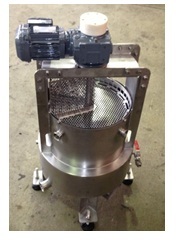 Heating/cooling chocolate mixing jacketed tank. We specialize in developing new full turn-key customized systems or modify existing ones to meet the customer requirements and Australian safety standards. We work closely to you right up through the start-up of your facility to make sure the specifications are met and the final product can deliver the expectations and we adopt your standards for equipment, components, and automation. Thanks to our 3D design package (Inventor) we can detail every aspect of the design and perform simulations prior the manufacturing stage to reduce costing and potential failures. Our facility allows set up and pre-commission the system before being installed reducing costs and down time on site. Servo-driven Pick and Place system with reject conveyor, reject station and overhead conveyor redesigned, modified and installed to be able handle different products and a speed of 180 products per minute for the dairy industry. Automatic horizontal cheese wire cutter. Please follow our link to Google plus for more info and video. 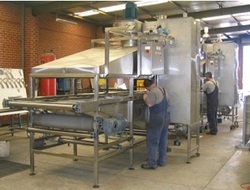 Automatic cheese boiling salt bath machine to kill outside spores and prepare product for application of new spores. Please follow our link to Google plus for more info and video. Upgrade of a cutting press capable to handle various sizes of products and increase production efficiency. Stainless Steel conveyor chips dryer. At GP’s Fabrication we can manufacture high quality tube or pipe spools, skids, and modules in 304, 316 or 2205 for customers in a wide assortment of industries and applications. We can design and fabricate systems from concept to meet your requirement and standards or manufacture following your design. Our highly skilled tradesmen apply the best techniques to satisfy the engineering, safety and hygienic industry standards. We also offer orbital welding services for pharmaceutical applications where very high hygienic standards are required. We provide a variety of different types of testing that include, but are not limited to, hydro-testing, leak testing, liquid penetrant testing and visual examinations. Final inspection and testing is performed on our pipe spools and skids before being shipped to the customer. This helps to ensure that we consistently supply the highest quality of products to our customers. Quality, performance and service are our promise to our customers. GP’s Fabrication has the experience, required shop space, and record of achievement to fabricate your next project. Chocolate jacketed pipework lines for a dairy factory. 3D design of CIP skid and pipework layout to clean diaphragm pump. 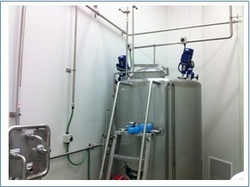 Installation of ice cream freezers, fillers and pipework for a dairy factory. GP’s Fabrication offer project management co-ordinating subcontractors, finances, time and logistics leaving you and your team to look after the fundamentals of your business. We can install your new equipment or relocate entire plants all around Australia and we can assist you providing our expertise in redesign your layout and/or supplying new equipment to suit your requirements. We had experiences in relocating dairy, pasta, chocolate and pharmaceutical plants.